OUR MISSION IS TO INSPIRE AND GUIDE SWIMMERS OF ALL KINDS IN THE OPEN WATER. Coach Pedro Ordenes is known worldwide for his record-breaking swims. Pedro is the only person to complete a round trip crossing of the Beagle Channel between Chile and Argentina, in water temperatures averaging 39F and without a wet suit. He participated in a successful English Channel relay and in 1999, Pedro swam across the Strait of Magellan in 39.7F waters just to celebrate the new millennium. 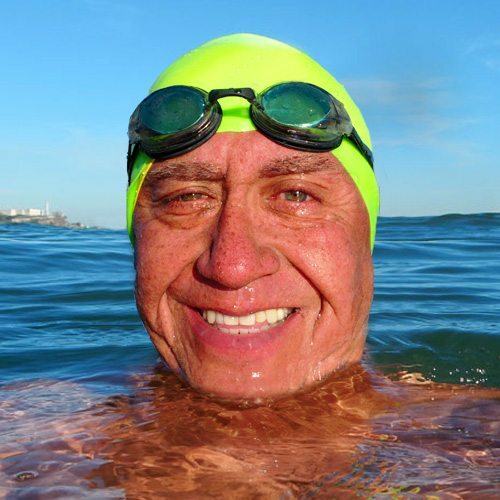 Coach Pedro has completed the San Francisco Bay Alcatraz swim hundreds of times, using his experience to teach, coach and inspire thousands of swimmers from all over the world. In 1990, Pedro brought his passion and expertise to the Bay Area by founding Water World Swim. His mission was simple: to help swimmers make the transition from pool to open water, and to inspire a love and enthusiasm for the sport. Water World Swim isn't just an event organizer - we are an international community of passionate swimmers from the open water beginner to the Olympic hopeful. We aim to provide a safe, guided, and fun environment for people to uncover a lifelong and life-affirming love for swimming and to be a trusted resource for all. From weekly group practice in the bay to long distance international challenges, Water World Swim is the go-to hub for all that is open water swimming. We guarantee that not only will you become a strong and confident open water swimmer, but that you'll have a warm and happy welcome to our global family! Here in the bay - and beyond! Coach Mike swam out of the womb. From ages 8 to 18, he competed on summer league and high school teams. He has been training and competing with masters programs since 1995, currently training and competing with the Tri Valley Masters out of Pleasanton, California. 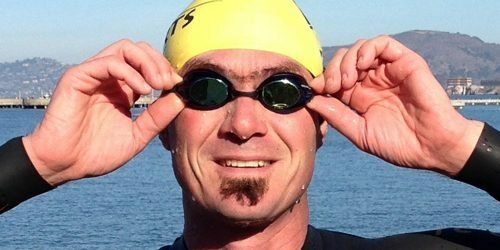 In 2007, he got his introduction to open water swimming by completing his first Alcatraz under the eye of Coach Pedro and has been swimming in Aquatic Park ever since. Coach Mike is an ASCA level 2 coach. He has been coaching for James Logan High School in Union City, California since 1997. He has been the head varsity coach there for the least 9 seasons. Coach Rene Rodriguez got her start in open water swimming in 2009 with Water World Swim San Francisco and since then has been a regular. She enjoys working with the new swimmers, helping them to adjust and feel comfortable in the bay. Primarily a marathon runner and triathlete, she has completed 6 Alcatraz swims with WWS and has always made it to the finish line. You can read Rene's blog here. Noelle started swimming in leagues at age 6 and continued through high school. After nearly 20 years of being out of the sport, she was with a family friend in his 60s when he mentioned that he does an Alcatraz swim every year. She couldn't believe it was possible! He explained the event and how it was done, and she accepted his challenge to start training and signed up that day. 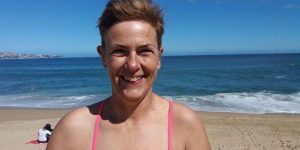 She completed her first crossing in September 2009 after training with Water World Swim and shortly after became an Assistant Coach and is now ASCA Certified. She most enjoys taking first time swimmers out into the bay, whether it's their first weekly workout or a one on one crossing! Kathy says, “I somehow qualified for the Ironman Kona. I did it as an adventure, something I may never have the opportunity to do again. Earning a slot to go was a gift not to be overlooked. I was extremely nervous about being able to even complete the event, this was my only goal. I had a wonderful experience while doing the race, it was actually quite blissful for such a long day, and the added bonus was I did quite well. I have been back to Kona 7 times and been fortunate enough to podium six times. Who knew I would find something that would shape my future so strongly at age 35? [...] Set your mind to something and the possibilities are endless. Don't let anyone tell you that you are not capable, find out for yourself what you are made of, the results may surprise you." Ann has been coaching with Water World Swim since January of 2011. 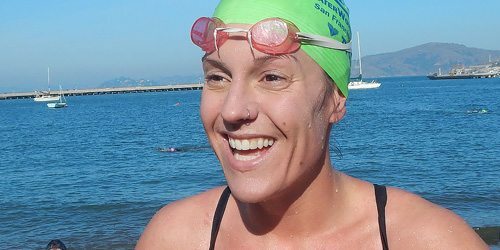 She completed her first Alcatraz Crossing (which was also her first open water swimming event) in December of 2010 and was immediately addicted to swimming in the bay. Because of Pedro's influences she swims without a wetsuit, event during the chilly winter months. She is a licensed swim coach under the American Swim Coaches Association. When she isn't guiding swimmers in the water, she helps out with our large events, as she bring years of event planning experience to our team. Ann has also swam in more southern waters of Chile, and has supported in the planning of WWS events there as well. Ann believes that the best views of the bay can only be experienced from inside the water and says that she feels the most at peace when in the center of the bay, with Alcatraz behind her, the Golden Gate Bridge to her side, and the city landscape straight ahead. Coach Angela started swimming at age six in Palm Desert, California and began competing when she was in high school with both her club and high school swim teams, in addition to playing water polo with her high school water polo team. Angela completed her undergrad education at the University of California, Berkeley and swam with the Cal Aquatic Masters swim team while in school. In 2006, Angela held a W18-24 U.S. Masters Swimming top ten time for 100 yards Butterfly and in 2007, she held three W18-24 U.S. Masters Swimming top ten times: 50 yards Butterfly, 100 yards Butterfly and 100 yards Freestyle. Angela was also the founding president of both the men’s and women’s club water polo teams at UC Berkeley, when they became officially recognized as University club sports in 2007. 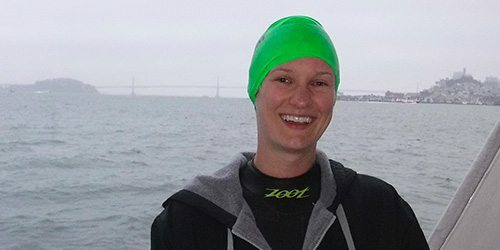 Angela completed her first and second Alcatraz crossings in 2015 with the Embarcadero YMCA Masters and was instantly hooked! 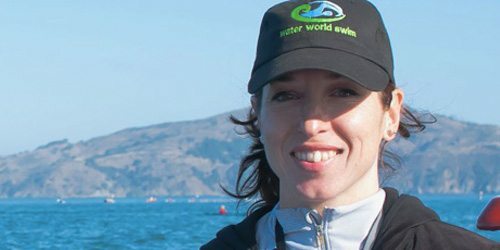 Subsequently, she joined WWS and competed in several more swims, which included the Golden Gate Bridge Swim where she was the third woman overall. 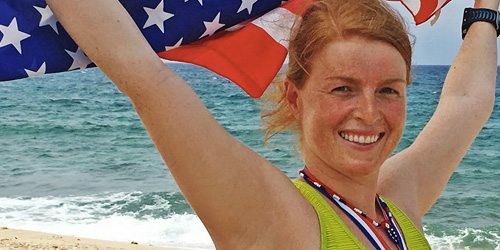 In 2016, Angela competed with WWS at an international swim competition in Cuba and placed second overall in her age group for the pool competition and first overall in her age group (second woman overall) for the 3k open water swim. Angela joined the WWS coaching team in Spring 2016 and is excited to see you out in the water! In 2001, Coach Jake began swimming with Pedro and Water World Swim - learning in the bay and never looking back! He is an accomplished age grouper triathelete in over 50 various lengths and has five Iron Mans under his belt. 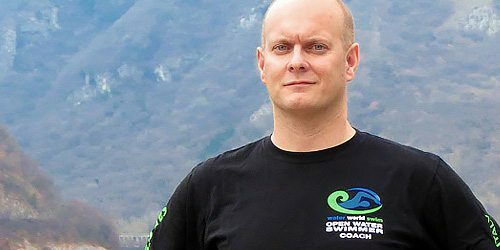 In 2010 he began coaching and became the lead kayaker for WWS in 2011, having supervised over 50 various swims. Coach John has been a Personal Trainer since 1992 with a Masters in Fitness. John was on swim teams from grade school through high school, triathlons for six seasons, and masters teams since 1996. He started open water swimming in 2008 and gratefully joined Pedro and WWS in 2012. He hasn't worn a wetsuit yet! 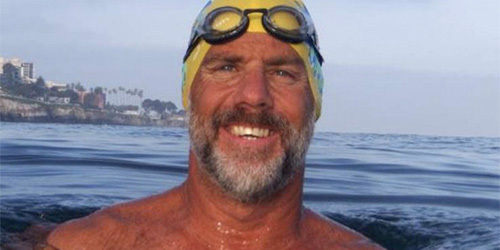 Dan Simonelli is the founder and director of the Open Water Swim Academy, based in San Diego, California. 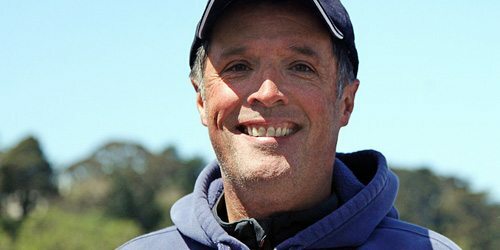 He has coached hundreds of open water swimmers of all ages, from recreational to competitive to marathon swimmers completing major open ocean marathon swims such as the Catalina Channel, the English Channel, Molokai Channel, and others. Dan was awarded the MSF 2015 Streeter Award for Service to Marathon Swimming and the 2016 Barra Award for Best Overall Year by the international Marathon Swimmers Federation. He was also recognized on the World Open Water Swimming Association’s list of the World’s 50 Most Adventurous Open Water Men. Dan was a competitive age group swimmer growing up in Stockton, CA, and also competed for Palomar College in San Diego. Dan served in the U.S. Marine Corps, and during his duty he had a supplementary position as a Water Safety and Survival Instructor. He later worked as an Ocean Lifeguard-­‐EMT and ocean lifeguard instructor for many years. Dan serves as an Official Observer for the Catalina Channel Swimming Federation and the Santa Barbara Channel Swimming Association. 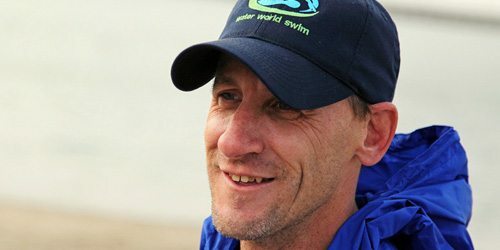 Dan also is a member of the voting panel for the International Marathon Swimming Hall of Fame. Alessandro is from Italy and says he "was born between the mountains." From ages 3 to 28 he was a skier, competing all over the Alps. He reached high levels in giant slalom and super giant, but at 28 he developed a back problem and had to put his ski career on hold. It was only after surgery that a doctor recommended swimming above all else. And so the adventure began! A self made swimmer, Ale swam every day in the pool and eventually was bored. So he decided to attempt an open water experience, signing up for a Lugano Lake Crossing in Switzerland. It was so fantastic, he did it again - twice! In 2007, he completed a Messina crossing in Sicily and while there heard about San Francisco's Alcatraz crossings. Meanwhile, Ale became a lifeguard, swim instructor, and then coach of the Italian Swim Federation. He trained children and young adults from 7 to 20 years, and is very proud of his little champs. In 2012 he met Pedro, completed his first Alcatraz, and discovered cold water swims. Since he lives far away from the sea, he trains in a lake near his home - and is lucky because it has similar conditions to the San Francisco Bay. In summer, the temperature is around 16°C and in winter, 7/8°C. Hydrotherapist and veteran guide's unique field of study and training pool for babies and children with special needs, and owner of "Waterworld Uri Sela" - Center for Professional Studies swimming and water activities. Ori is a graduate of the Wingate Institute instructors and coaches on the rehabilitation of the disabled and hydrotherapy, and has a BA (IDC) in Business Administration and Marketing. Ori has numerous seminars and courses in handling and training for all ages in the areas of nutrition, massage, Chinese medicine and shiatsu. Uri believes that physical exercise contributes very true balance and connection between body and soul, and water treatment. In this way, each encounter with swimmers (large and small) in the water world ends with a big smile. Ori, an athlete and a swimmer (in regattas and championships in Israel and abroad), a guide and a swimming coach, deals with fears of the water, swimming toddlers, trainer and therapist in pregnant women, swimming instructor rehabilitation and hydrotherapy (Watsu, G'hara and Oatrdns, Hey T., Hlweik) Founder swimming techniques to treat such other method WEST and Dave dive master, triathlon coach (swimming, running and bicycle), Krav Maga instructor and jumpmaster. Sarah joined WWS in 2017 during her days in Chile, training for the Beagle Channel Crossing. She was born in UK and moved to New Zealand 13 years ago. She started swimming at a very young age, and 6 years ago she became interested on ocean swimming entering several open water competitions in NZ like "The Beach Series" and "King Of he Bays". She has experience coaching swimmers with intellectual disabilities. "I used to swim in open water with them which was sometimes quite hard-going but good fun. Out of the three, the 2 now have progressed to long-distance swimming on their own, one of them has gigantism, low social IQ and the other young man was born with a portion of his frontal lobe not connecting to his left and right hemisphere of his brain. There life's changed, physically and socially with the benefits of swimming in open water." "When you start competitively swimming, just relax and enjoy, it is not about the time or placing you get, it's about the enjoyment of finishing the swim. Breathe! Open Water swimming brings so many like-minded people together from all over the world and all walks of life." Keeping us afloat on shore and the internet. Lauren brought her skills in web, media, and imaging to Water World Swim in 2013, starting with a brand new website. 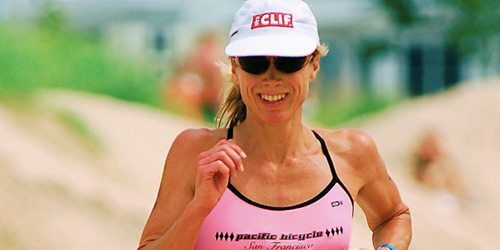 She is a 3-time San Francisco Marathoner and will swim the Golden Gate Bridge in 2017. 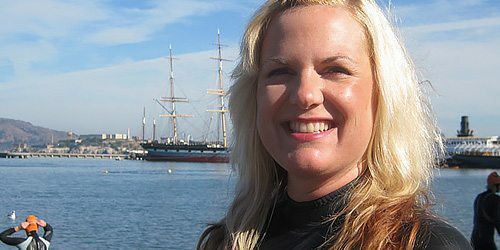 She has completed Alcatraz four times and is looking forward to more bay adventures! Dave began his racing career in the water. As a backstroker, he swam his way through school and graduated college with several school records and accolades. 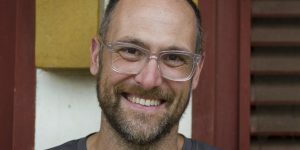 After graduation, he was filled with a desire to look at something besides the bottom of a pool, so he bought a bike and a pair of running shoes and began racing triathlons. Throughout his 20 plus years of racing, Dave has competed in pretty much everything from 5ks to 50ks, open water swims, and local dip and dashes to Ironmans. Recently, he has been focused on Aquathlons and has twice been ranked by USA triathlon as the nation’s number 1 aquathlete for his age group. In 2016, Dave won his age group at the National Championships in Santa Cruz. While Dave began swimming with Water World Swim over 20 years ago, he has only recently begun to collaborate with Pedro on the development of the Splash & Dash World Aquathlon Series. He looks forward to his growing involvement with Water World Swim and helping to grow the sport of aquathlon around the world. Juan Carlos was born and raised in Viña del Mar, Chile. In 2011, he finished his college studies with an Industrial Design degree at Universidad de Valparaiso, Chile, designing and building electric bass guitars. At the same time, he was self-taught and working in web, media, and video editing. 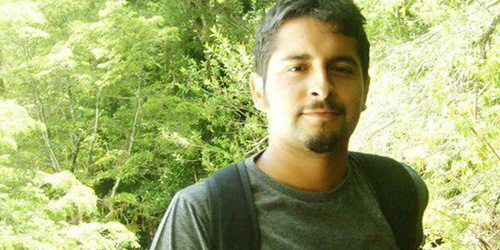 One year later, he moved to Santiago to work as an office designer on Scenography works for popular TV shows in Chile. Now he works independently for several Chilean brands. Not being a high-trained sportsman, Juan Carlos loves to play soccer, bicycle, skateboard, and run, and he hopes to get in open-water swims sooner or later. Solange Degand is from Chile, she loves open water swimming, triathlon and water sports. 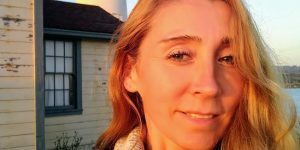 She is a registered nurse and currently lives in the San Francisco Bay area. She is volunteering with Water World Swim supporting Pedro in the logistics of local swim events and preparation for international swims crossings. Bob grew up in San Francisco, and is a recently retired San Francisco Police Officer after 35 years of service. He has extensive experience as a supervisor, coordinating and planning several major sporting events in the city and has also been the primary coordinator/planner for a variety of SFPD charity events. 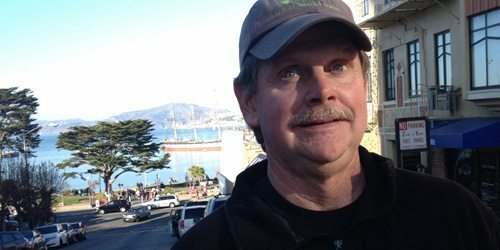 Bob enjoys the Bay Area outdoors on the land and water as a bicyclist, runner, kayaker and hiker and takes great pride in sharing the beauty and enjoyment of SF Bay and all it has to offer. Open Water swimming in San FranciscoBay is world renowned, challenging and a unique experience in the world of swimming. At Water World Swim, we strive to made the San Francisco Bay swim enjoyable, fun, instructional and safe. Bob is proud to be a member of the World World Team.